The Ox Horoscope 2016 forecasts that this year will bring in major changes in your life. Other people will be highly helpful and encourage you to achieve your objectives throughout the year. You need not follow an independent course. This is the time to formulate new strategies and execute them without fear. The Chinese zodiac sign Ox will seek to make radical changes to your life and whatever obstacles that arise will be resolved by your practical approach. Oxen, your emotional strength will be enhanced by the influence of planets in your birth chart. You should use your intellectual capabilities to prevent you from taking incorrect decisions. Do not get entangled in legal hassles while helping others in the month of June 2016. The 2016 Chinese horoscope predicts that you have to develop more optimism and avoid the company of people who try to use you in attaining their goals. You have to examine the quality of your relationships between May and October 2016. Discard some of them if they are not sound. Your natural instinct will be at its peak during November and December 2016, and you can rely on it to achieve your objectives. Read about Cow symbolic meaning. The Ox 2016 horoscope also predicts that married people will have some misunderstandings in their relationships between the months of May and August 2016. This can be resolved with some give and take on both sides. Chinese zodiac compatibility predicts that relationship with your spouse becomes constructive by end of 2016 with encouraging inputs from your partner. You can leave your worries behind and travel to serene places with your spouse during June and October for a short vacation. Spending more time with your partner will make love life passionate. Maybe it will also bring good news of a child, if you are planning to get pregnant! The Chinese horoscope Ox predictions for 2016, show that romance and passion are indicated for single Oxen in 2016. Existing partnerships will be fortified with your commitment and feelings, while new romantic love affairs have good chances of success. People in serious relationships can get married if both are willing. New love mates should understand each other well and should not be in a hurry to tie the knot. The 2016 Ox horoscope foretells that if you are in a professional job, and looking for a change, the period between June and September 2016 are auspicious. Your social contacts will be helpful in helping you to get a better job. Instead of trying to do too many things, you should concentrate on a few important goals if you want to achieve financial success in business. A senior person will be of great help in completing your targets and in solving personal issues. The Year of the Monkey 2016 predictions forecast that your high level of optimism and intelligence combined with diligence will assist you to develop your professional or business life during all the twelve months of 2016. Ox people tend to take short cuts to succeed which may lead to legal complications. It is imperative that you should follow a legal course in enhancing your career prospects. The Ox 2016 horoscope forecasts that your financial intelligence and analytical skills will be at their best up to August 2016. You have to examine your expenses and cut down avoidable expenditure while determining your monetary objectives. This will be of great assistance for the future. Last three months of the year will be challenging on the financial front. You will have to take care of some necessary expenses towards your family and associates. All other unnecessary expenses should be cut down to have better financial health. This will have a beneficial effect on your health and confidence in the Year of the Red Fire Monkey. Get your horoscope 2016 to know more. The Ox 2016 predictions foretell that your physical health will be excellent throughout the year and you should avoid rigorous exercise during the period between September to November 2016. Your energy level will be high and you will be using it judiciously throughout the year. This in turn will add to your physical energy. You should pay sufficient attention to your social life and take enough breaks to enjoy your life in the company of your family and friends. Life may be hectic during the middle of 2016 and the Cow people should relax well to avoid being stressed out. Your relationships with family will be harmonious and you are at peace with your surroundings which will enhance your emotional health. The 2016 Feng Shui yearly horoscope for the Ox predicts that chances for gaining money and studying further is very high. 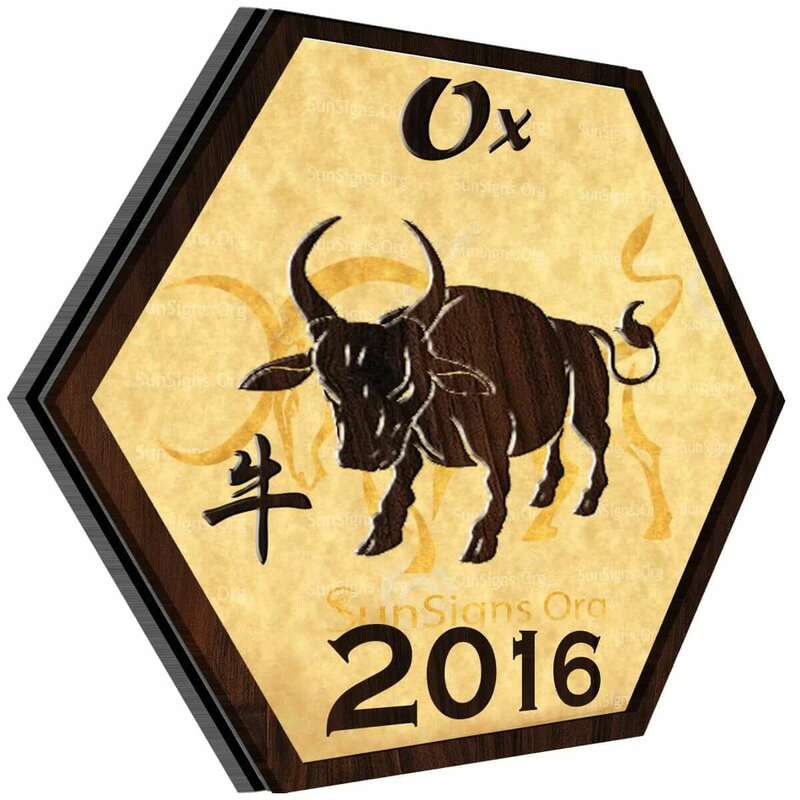 To conclude, the 2016 Chinese horoscope predictions for the Ox forecast an emotional and happening year. This period is favorable for you, so make the most out of it!